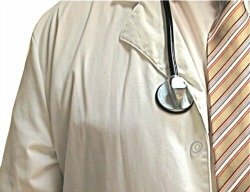 Do Not Want You to Know: Really, Doctors Do Not Want You to Know? flier or advertisement? Well, there is something that the people promoting this thinking do not want you to know. Please check it out. Let me know what you think. Some of the supplement promoters are the antithesis of the pharmaceutical / medical profession. We like to think there is a middle place that provides the best care. It starts with you being an educated consumer. The lady with an obstructed bowel I admitted at 10 PM on a Sunday night. She was from out of state. She took a natural home remedy. If a little was good, more should be better she thought, right? She was at the hospital with a perforated bowel (a busted gut) from this home remedy. Or how about the lady who was told by her friend to drink as much water as possible to detoxify herself. Some refer to the end result of doing this as hydrogen hydroxide poisoning. In reality, this natural cure resulted in hyponatremia or blood sodium levels falling so much that she had a seizure (and probably came close to dying). Consider one of my friends who tried one of the water cure only did not follow all the instructions. He decided to skip the salt. It landed him in the hospital. The reason, his electrolytes were so out of balance, and especially his potassium that he needed IV medical intervention. Interestingly, he was taking 5 potassium pills a day. The worse offender is a calcium product that has more lead and other dangerous substances than the everyday calcium you can buy at the supermarket. They will often say that your doctor does not want you to know about this special coral type of calcium. The fact is, they are wrong. I have heard many doctors, nurses and health care professionals say take calcium, only not this dangerous type (independent laboratory tests find it inferior). Actually, any calcium supplements should be avoided based on the latest science. They are dangerous. It is much healthier to eat at least 50% of your diet as vegetables and fruits. It is even better if you eat them raw and best if you eat live foods. By live, it is referring to seeds for instance sprouting seeds before you eat them vs ones that have been roasted or even pasteurized. The promoters of the Doctors Do Not Want You To Know mantra do not want you to know that many home remedies, natural cures and holistic medicines are unsafe. They do not want you to know that some are actually dangerous if misused. There is just no substitute for good medical care. But wait, isn't this a holistic health care site? Yes it is but that does not mean going to the other extreme of taking numerous supplements. Most of what we need can come from foods. Supplements are only for rescue purposes, emergency or sever lack in our bodies. What About the Glutathione Disease Cure? This brings us to the Glutathione Disease Cure. It is not a cure in the scientific sense. According to Dr. Jimmy Gutman, MD, FACEP, glutathione will help your body deal with health challenges. It will help the body to deal with problems like aging, aids, cancer, diabetes, hepatitis, lung disease, kidney disease, digestive diseases, neurological disease, athletic performance, child birth, heart disease, stroke, cholesterol, wound healing to name just a few. The Glutathione Disease Cure web site will teach you about each of these. If you are one of the tens of thousands who are turning 50 each day, it is time to start taking charge of your health. One last word...Natural Healing vs. Medical Healing? What you will discover next is anecdotal information. That means it is only as good as an opinion from Aunt Emma or your next door neighbor. But, you don't have to have gone to Antarctica to know that it is there. At some point, we need good old common sense to make decisions. I asked a doctor who practices both holistic health and traditional medicine, depending on what the patient desires, which has greater success? The answer, the outcomes are the same. No greater or worse benefit going one route or the other, at least in her practice. I also asked about outcomes from a friend who is an apothecary, a PhD in herbs and healing. My hospital employer had clinically trialed some of his preparations with outstanding success. He has an 80% success rate treating breast cancer, the hospital tout an 83% success rate. Clinically that is an insignificant difference in rates that the hospitals I worked for had. It should be noted though, the hospital cancer cure rate is between 2.5% and 5% that you will live for another five years for most cancers. If you live for 5 years, it is considered a success. Many natural cancer treatments have far better outcomes and less side effects and vastly lower costs. The important thing to take away is this, the Glutathione Disease Cure will not necessarily work for everyone. A number of factors like disease progression, the ability of the individual to properly care for and manage health, and uncontrollable factors can all have an effect on any treatment we undertake. The Glutathione Disease Cure site will help educate you to better work with your doctor and nurses toward optimal healing. Or if you prefer to do 100% natural, this will provide the information you need to get your health back. people have experienced tremendous success with learning how to help their bodies heal themselves. The information on this site is not intended to diagnose, treat, or manage disease or disease processes or in any way go against the advice of your Doctor or professional health care practitioner. There are some contraindications to the suggestions found here. Only undertake changes under the supervision of a medical doctor. We cannot stress this enough. Continue to work with your doctor if you already are under his care. If not, then become an educated consumer. Glutathione, Health care Politics and the Flat Earth Myth A theory on Health care ignorance.